HOLA! I just came back from the exciting and also interesting Cupcake Workshop organized by Nuyou Magazine and Cake Connection (a baking school/shop I think) at Jaya One, Petaling Jaya today! The workshop started at 6pm until 9pm! 3 hours I know! but you know what.. this workshop was so fun that 3 hours seems like just flash by! I would like to share more but bcoz I don't have a pc atm, my bf is giving me some devil look on his face now for using his pc to blabber. 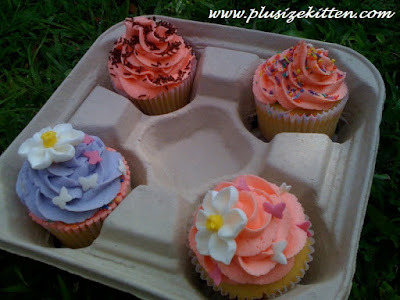 Will talk more again, but now pls check out my cupcake creations! 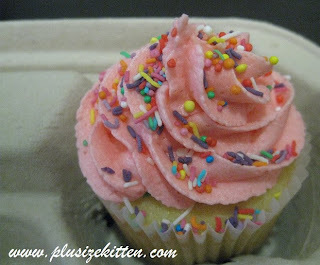 I have personally decorated the cupcakes after what I learned from the workshop today!!! "MEOW!" 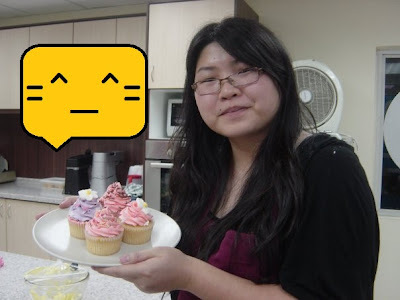 Miu at Cupcake Workshop! Which would you buy if u see this at shop?! Check out Cake Connection's Website here for more info! It's a one stop cake baking and speciality store in Malaysia! That coffee container looks good in pictures.. lol! You've perfected the art of making swirls.. Pretty! if you ask me, i wouldn't buy any because the icing on top is far too sweet for me to handle. 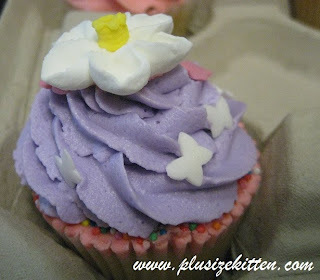 Abby: this one basic workshop, but they give recipe n show you how to do cupcake. Later then take the cupcakes out and teach us hands on how to decorate. It was really fun..
that's about the only thing i know how to do ..yesterday lol..
Jean: u blog bout yours yet or not? i wanna see ur pics! I enjoyed the workshop very much!! 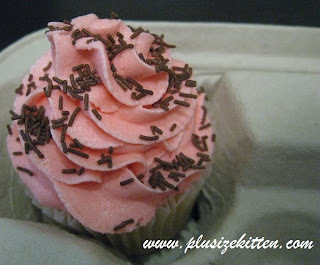 The cupcake and icing are not too sweet - just very delicious. Nancy, the w/shop leader, gave us copies of the cupcake recipe and demonstrated how to make them at the w/shop - it looked very easy. Any idea how to join this workshop and how much is the cost? Im kinda interested. Now im hungry for dessert after checking out your creations. 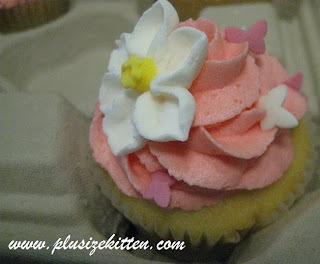 I adored the pink spring cupcake, simple decoration and look delicious. hehe.. got make for your honey or not?